A cute little town on the Cairns hinterland. Drenched in an irresistible market atmosphere and engulfed by World-Heritage listed natural scenery, the small town of Kuranda is among Australia’s most sought-after travel destinations. Even though this Far North Queensland township is petite in size, there are plenty of enticing attractions and activities to humble tourists of all ages. Getting to the town from Cairns, its nearest major city, is part of the adventure. Travellers can take the Kuranda Scenic Railway, which is a picturesque one-and-a-half hour journey through some of North Queensland’s most iconic natural landscapes. 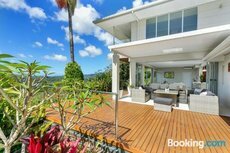 Another option is to travel via the treetops using the Skyrail Rainforest Cableway, which extends from Cairn’s Smithfield suburb to Kuranda, spanning over the Barron Falls. 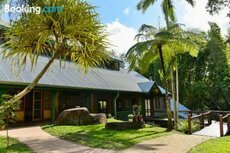 Kuranda is predominantly visited as a day-trip from Cairns, but there are several small hotels scattered across the town, allowing for comfortable overnight stays. While exploring Kuranda, the markets in the downtown area are the first stop for most tourists. The stalls are filled with a range of items, from locally-made artwork to trendy fashion items. The Kuranda Railway Station, which was built in the late 1800s, is a heritage-listed site worth checking-out too. Natural rainforest surrounds the town, making it an enjoyable spot for nature-lovers and bird-watchers. 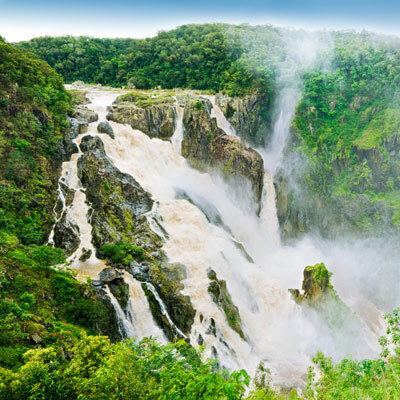 The beautiful Barron Gorge National Park, which boasts the majestic Barron Falls, is only a 45-minute walk. While there, experiencing the sweeping vistas from Wright’s Lookout is a must. The wildlife treasures of the tropical north can also be found in several parks around Kuranda. Visitors will be greeted by a range of local bird wildlife at Birdworld, and the nearby Kuranda Koala Gardens provides a unique opportunity to come face-to-face with some of Australia’s most iconic animals, including koalas, kangaroos, crocodiles and frilled-lizards. There are several cozy accommodation options located within the town. From most hotels, it is possible to explore many of the town’s landmarks and attractions by foot. 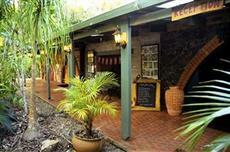 It is also easy to stay in Cairns and travel to Kuranda as a day trip. The day trip from Cairns to Kuranda is all part of the experience, either by the Kuranda Scenic Railway ot the Skyrail Rainforest Cableway.